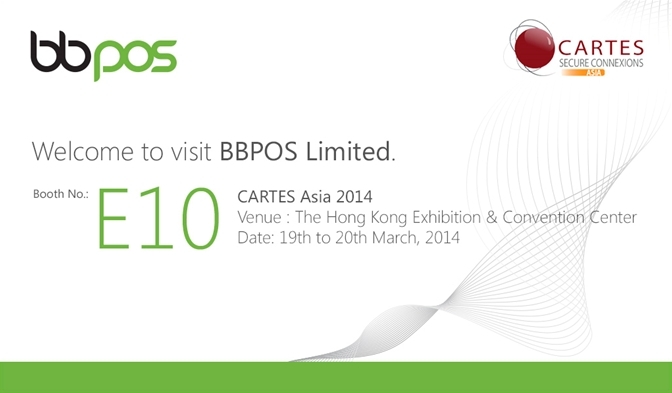 BBPOS will exhibit the Cartes Asia 2014 at Hong Kong Convention & Exhibition Centre from 19th – 20th March, 2014. Welcome to visit our booth at E10, to learn more about our secure mPOS solution. BBPOS will exhibit the Cartes Asia 2014 at Hong Kong Convention & Exhibition Centre from 19th –20th March, 2014. Welcome to visit our booth at E10, to learn more about our secure mPOS solution.